Sat. Oct. 15 to Fri. Oct. 21 Lakeland FL to Clermont FL. Saturday- Wayne made his famous pancakes for breakfast. We sat talking until lunch time, when we went to the club house for lunch. We returned at 1 and left at 2 to return to Clermont. I-4 was backed up, so we ended up taking a back road. We arrived home and picked up a package from the mail room. 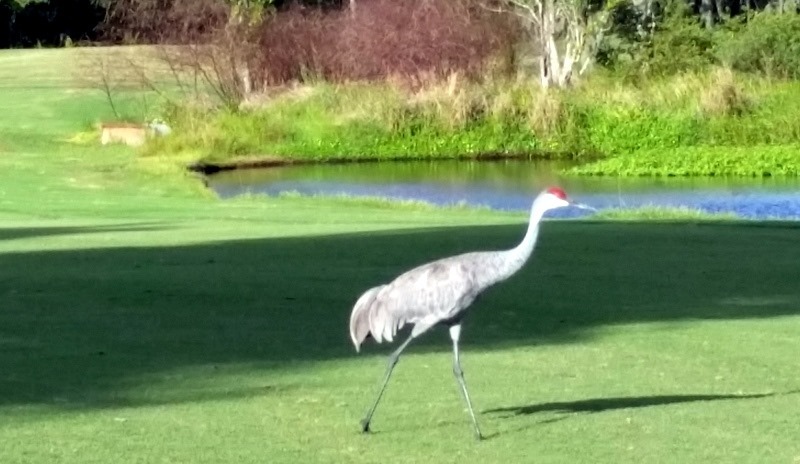 WE have seen these huge birds wandering in the RV park. We left at a little after 5 to go to dinner at Texas Roadhouse. We were trying to hit the early bird special which ends at 6 PM. We arrived at 5:30 and were told that there was a 30 minute wait. We watched everyone in the waiting room leave. At 45 minutes, I went to the desk. The girl said that she had paged us. Nope! Then she said that she send someone to call us. Nope! We were sitting right by the door to the waiting room. Hmmm! So we were seated and I asked for the manager. The waitress told us that they would give us the early bird. Good, but I still talked to the manager, who came over, but never introduced herself. Not our usual great dinner at TRH. The food was good as usual though! We returned home, watched TV and went to bed. Sunday- I work up early and did a ‘chat’ with Quicken, as I have not been able to back up since the last update in August. The guy was less than helpful. He gave me a link to read and hung up on me! The link is basically others complaining that they keep getting the same error message and Quicken is not responsive to anyone. Hmm, we have used Quicken for years and have never had this issue before! Very disappointed with them. So I backed up to my external hard drive instead of the $9.99/year cloud drive that I have paid for for several years! We ran to Walmart to pick up a prescription for Bob, then back to the MH for lunch. We watched the Redskin game and did laundry. We left at 4:45 to drive to Sanford. 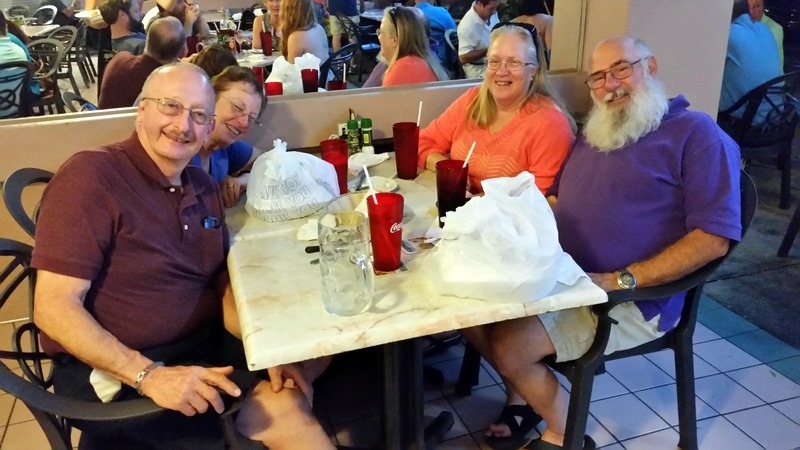 We met up with long time friends Marc and Rachel Nachman at a German Restaurant. We had a great meal and a wonderful time catching up with our old friends. Marc and I went to middle school and high school together. Monday- We were up and out the door early travelling to the Magic Kingdom. On the way we saw a beautiful sunrise and this hot air balloon sailing over the area. We arrived and parked in the Hero’s parking lot and took the tram to the entrance. Wow has this changed! We had to take the ferry from the area across the lake to the actual entrance! We arrived and while going through security, they found the selfi -tick, which we had forgotten was in the backpack. So they labeled it and took it to Guest Services for us to pick it up on the way out. We signed up for a locker and put the back pack into it. We then raced over to Tomorrow Land. We rode Space Mountain then took the train around the resort. At 9:40 we used our first Fast Pass for Buzz Lightyear. That was fun! 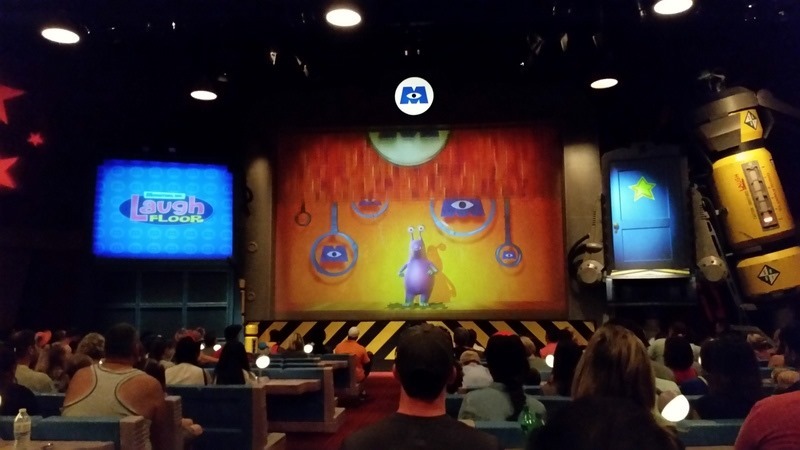 We went to the Monsters, Inc Laugh Floor,(second Fast Pass) which was interactive with the audience. 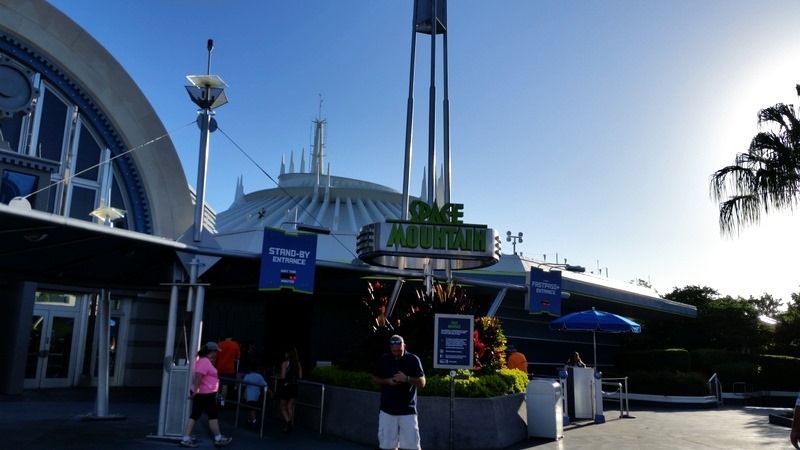 We had Space Mountain as our third Fast Past, but since we had done it earlier, we removed it from our list and added the Haunted House. We visited the Country Bears Jamboree, and went to lunch. Then we were off to the Haunted House. We were most of the way through the ride, when it stopped, then started again. Then the ride stopped. We spent about 15 minutes just sitting before an announcement was made that they were going to turn on the lights. Then the ‘cast members’ came through to the open the bars on the ‘doom buggy’ and escorted us out of the ride, back all the way through the attraction. 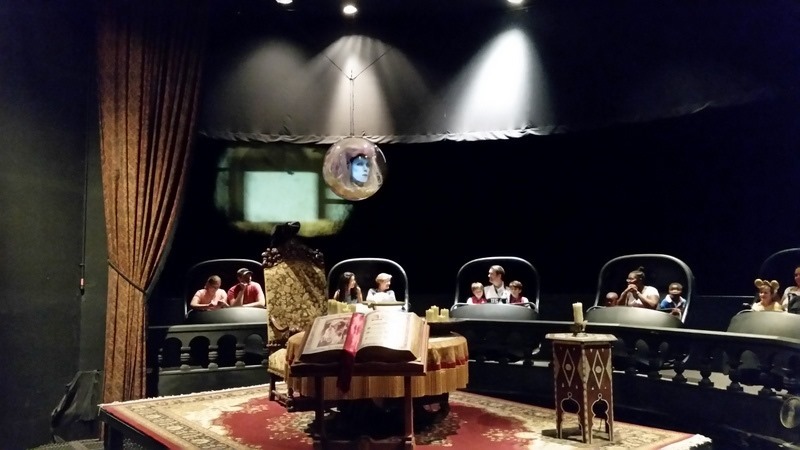 It was fun, as we were able to see a lot that you cannot see when going through the attraction. We were given a free Fast Pass for another ride. We stopped at the Hall of Presidents for the show. 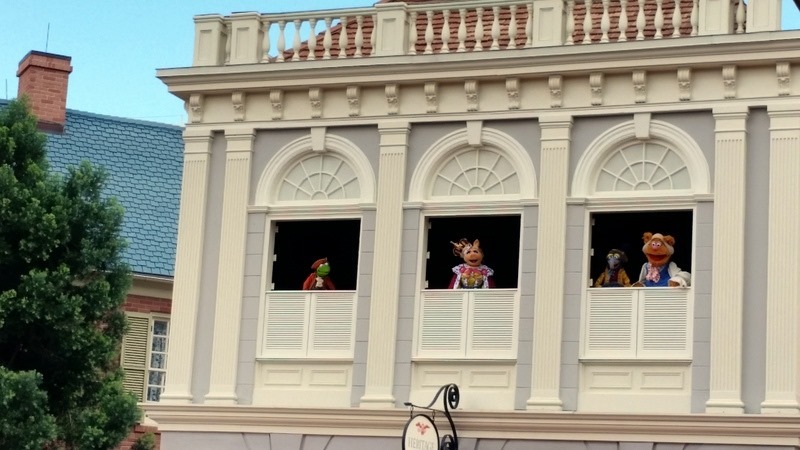 Below is outside, where the Muppets were doing a show prior to the Hall of Presidents presentation. The Hall of Presidents has been updated a lot since the last time we saw it in the 90’s with more Presidents!! We went to the Pirates of the Caribbean using the extra Fast Pass. 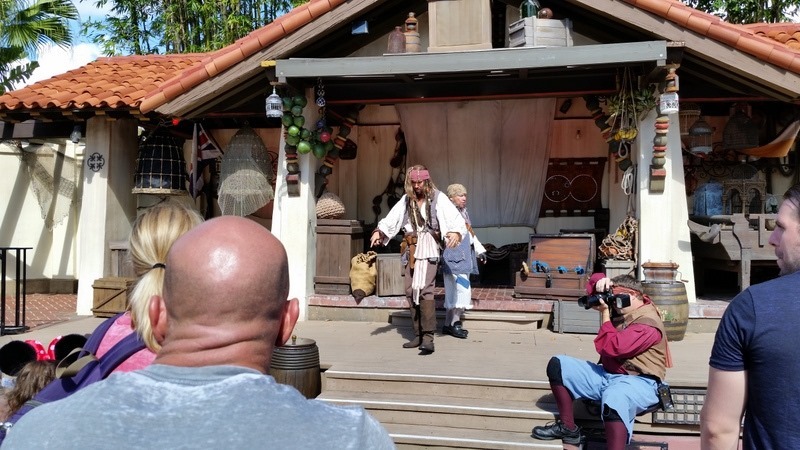 Below is Jack Sparrow doing a show outside Pirates. We left, taking the ferry back to the tram and then the tram to the parking lot. We went home to walk the dogs and feed them. We stopped at McDonalds on the way back to the park and had a quick dinner. We arrived and parked in the Villains parking lot this time. We took the tram in, then took the Monorail to the entrance. We went back to Tomorrow Land to watch the dancing and to ride the People Mover. We wandered around the park and split a hot fudge sundae. 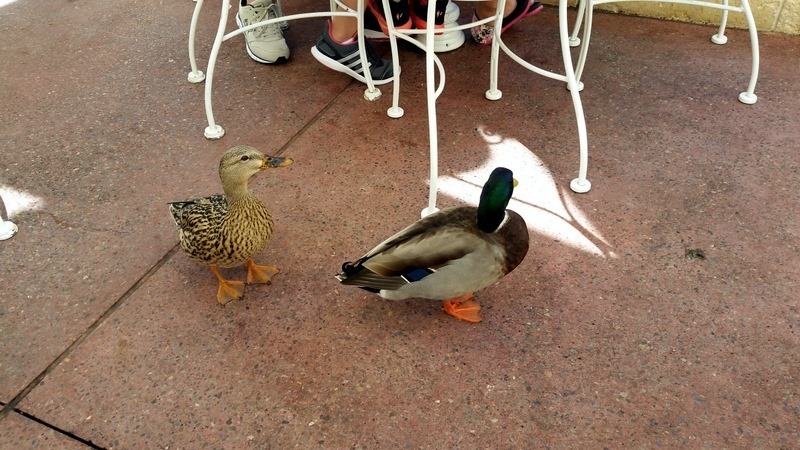 While we were eating the sundae, these guys were right at our feet, eating scraps from the ground. They sure are not staving to death! We found a spot to watch the Celebrate Magic show and the Wishes Nighttime Spectacular. The show started at 9:45 and the fireworks at 10. We are able to hear the fireworks each evening in the MH, so it was nice to actually see them! 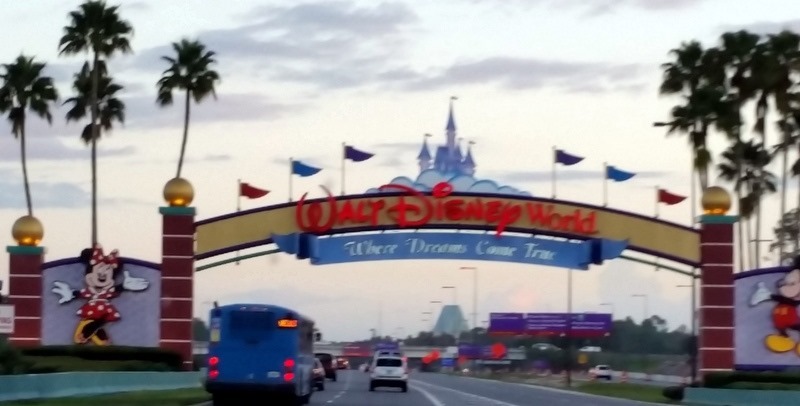 It is the only time that we realize how close we are to Disney, as the crow flies! It is a 10 mile ride via car. We took the Monorail to return to the tram, which we rode back to the parking lot and drove home, arriving at 11PM, after a very long day and walking over 18,000 steps! Tuesday- We were both tired and I was coming down with a cold. We went down the road two miles to pick up our mail. When we arrived, we found that the Post Office did not accept General Delivery mail. Huh? I had checked the USPS website and it said that they accept General Delivery. The workers said that they have been complaining about that to USPS but it has never been taken off the USPS website. So we had to drive 16 miles into the city of Clermont to pick up our mail. This is the first time we have ever had an issue with General Delivery mail! We went to the Chiropractor at The Joint, in Orlando and stopped for lunch at Panera. We came home and I took a long nap, waking up with the cold worse. We settled in and watched TV. Wednesday- I was really feeling lousy today, so we did nothing. Bob went to run an errand and I stayed home. I took a long nap, we watched TV and generally had a quiet day. Thursday- I felt a little bit better. We left at 10:15 and went to Disney Springs. 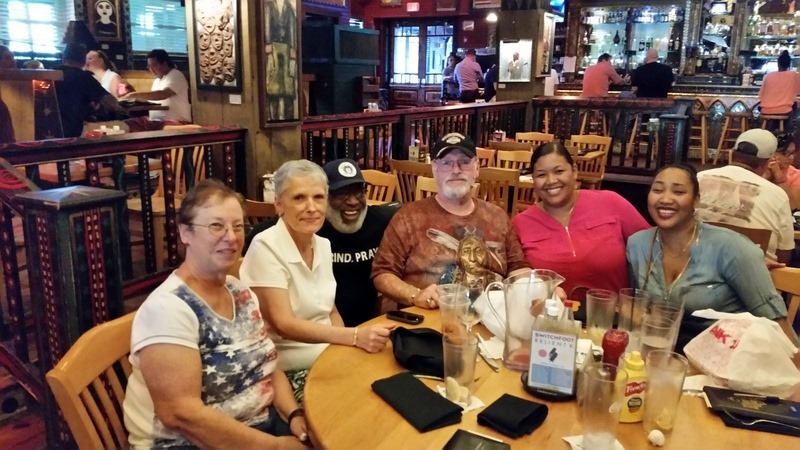 We were meeting up with Mike and Sarah Wrenn, Marvin Williams, and his two daughters. I went to Nursing School with Sarah; Mike and Marvin had hung out with the group of us. It was great to see these old friends after almost 40 years! The last time I had seen them was in West Virginia, 38 years ago at Mike and Sarah’s wedding! Plus it was nice to meet Marvin’s two daughters, one of which is my namesake, Janelle Denise on the right!! We ate a nice lunch at The House of Blues, and sat talking for 4 hours. 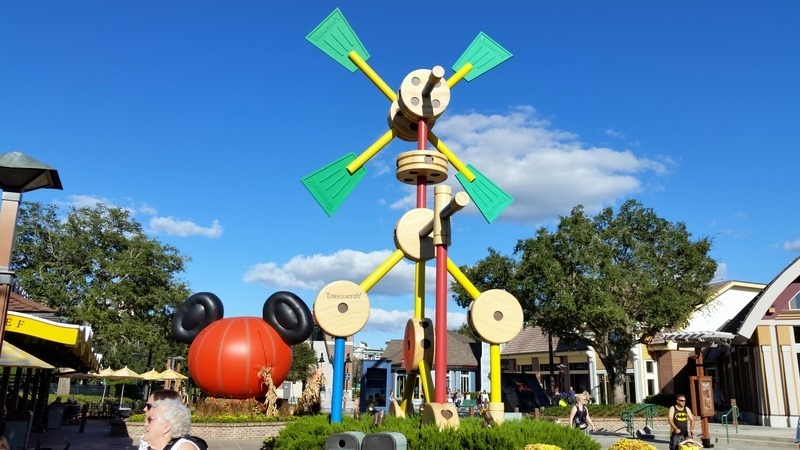 When we all left and said good-bye, Bob and I walked around Disney Springs. 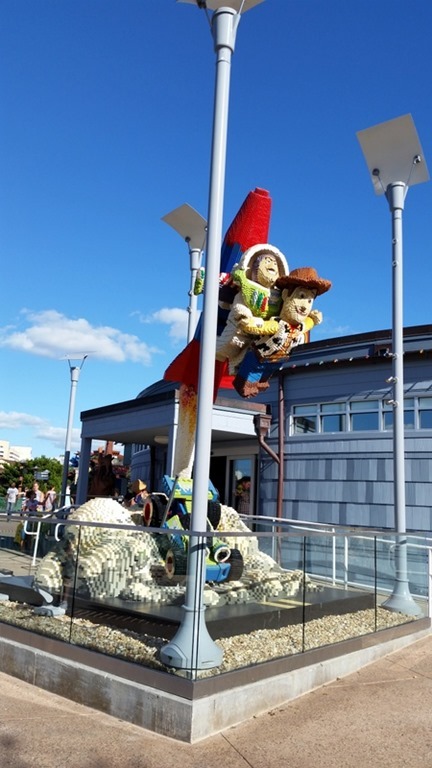 Below is a Lego statue outside the Lego Store. Above, the statue is in front of the Toy Store. 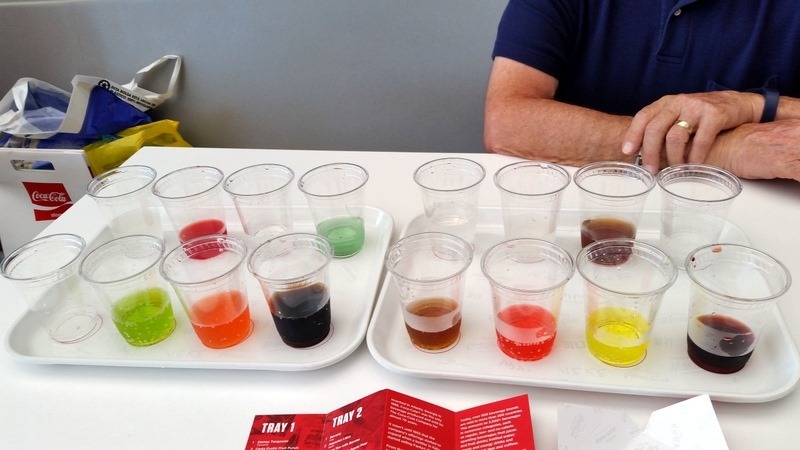 We stopped at the Coke Cola store and tasted a flight of cola’s from around the world,$8,50 for 16 tastes. Let’s just say that the tastes were different! I only liked two of them. 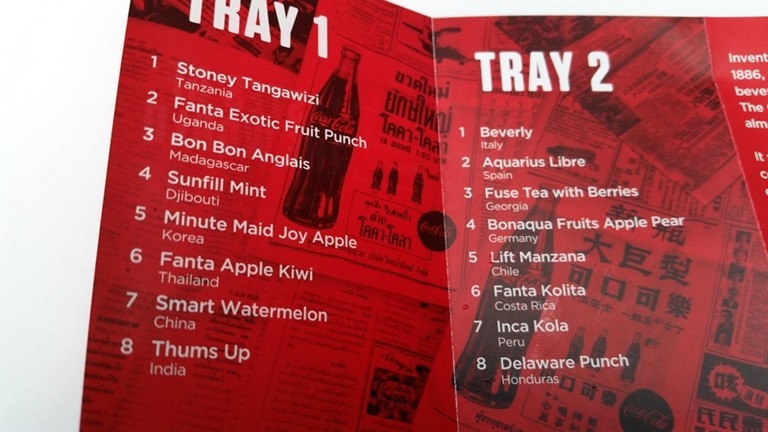 Above is the view from the Cola Store, as the tasting was on the third floor. The second floor was all sort of Coke items and the first floor was primarily Coke clothing. We left and returned home, ate dinner, and went to bed. Friday- I woke up feeling pretty bad again. We went to Walmart for a few items, then returned home, where I took a three hour nap. The groomer arrived at 2 PM to groom the dogs and she was completed by 4. I was feeling better so we went to the local farmers market, which was a bust. There were only 5 vendors and only one of them had vegetables, which were expensive. The bananas still had the supermarket tag on them! We continued on to dinner at Manny’s Chop House. We thought we were going for the early bird, as we had to be seated by 6, but it turned out that was only Monday to Thursday. It would only have saved us $1 each, so it was not worth it anyway. Sorry you were not feeling well. How long were you at Disney? BTW the big bird is called a Crane. Glad to see you are still living the dream. We are home for a while awaiting our new grandaughter to come around Thanksgiving then Noelle’s birthday Dec. 14 them maybe spend Christmas Eve with my family (it’s been a long time) then we have to be in Gaffney, SC freightliner on Jan. 9. Hoping we don’t get snow before leaving right after Christmas.